When Indian Point Shuts Down, Will Storage or Efficiency Save the Day? Competing visions have emerged for how to ensure capacity for New York City when the nuclear plant nearby turns off. Closing a nuclear power plant is like wading through wet concrete: The hard part is yet to come. That hard part is coming fast to New York, where the state’s political leadership committed to ramping up to 50 percent renewable energy by 2030 while shutting down the clean baseload power of the Indian Point nuclear plant by 2021. To meet several environmental regulations while providing for the necessary energy and capacity to serve the nation's most populous city will require some energy acrobatics. Adding 450 megawatts of energy storage could lower costs and carbon emissions compared to other options, while meeting grid requirements, a new study shows. "Storage can really be a viable option in these very tailored needs that are difficult to meet with other conventional resources," said author Ed Burgess, senior manager at Strategen Consulting. A different plan produced by environmental groups opposed to the nuclear plant argues that massive amounts of energy efficiency, combined with the required renewables expansion, can fill the gap. With the clock ticking, the state will have to decide which emerging grid technology deserves its favor, if it wants to avoid building a bunch of new gas peaking capacity. When Indian Point shuts down early in 2021, per the deal struck by Governor Andrew Cuomo, it will eliminate 2,060 megawatts of capacity, or roughly 14 percent of the local capacity required by the grid operator. Energy efficiency and distributed generation already underway will keep load growth flat over the next few years, but the state still has to fill the hole. Cuomo has big plans for 2,400 megawatts of offshore wind, but that's not expected until 2030 at the earliest. In the nearer term, New York can count on a few new combined cycle natural-gas generators, and possibly a 1,000-megawatt high-voltage transmission line to bring power from Hydro Quebec. There is risk in banking too heavily on massive infrastructure projects to bring clean energy down from the north in a timely manner -- they can be delayed for any number of reasons. Gas generation is a more surefire bet in the short term, but it flies in the face of the governor's promise of "no net increase of emissions due to closure," although his reference to measuring this "at the regional level" might allow some wiggle room. Compounding the challenge, the New York metro area has run afoul of federal ozone pollution standards, and old peaking power plants play a significant role in that. 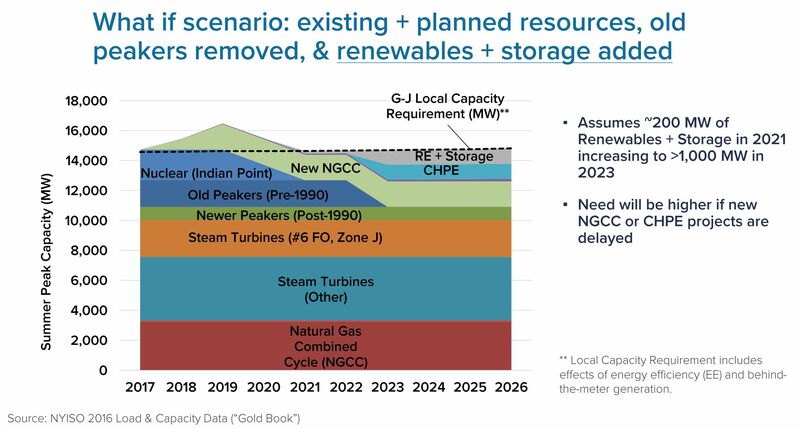 New NOx requirements could shutter 1,775 megawatts of old peaking capacity in the 2023 timeframe, according to the Strategen report, which was prepared for the New York Battery and Energy Storage Technology Consortium. "If those units are affected, that represents a pretty large amount of capacity that's local in New York City, and that would raise additional issues in that early 2020s timeframe," Burgess said. If that happens, even the addition of the new gas plants and the Quebec hydro line will leave a 1,000-megawatt shortfall. It's hard to build that much new peaking capacity in a dense urban region, especially one that's on notice for air quality concerns. And the region already faces gas pipeline constraints in winter months, when gas is also used for heating. Such a shortfall, without other action, would drive capacity costs up to the maximum clearing price, saddling ratepayers with $262 million in annual costs, the analysis finds. The report proposes filling the gap with a combination of 2,400 megawatts of wind generation, 1,125 megawatts of solar, energy efficiency, and, crucially, a backstop of 450 megawatts energy storage. Wind and solar can fill in for the lost energy production on an annual basis, but they alone don't fulfill the capacity requirement, which would otherwise force the construction of new gas plants. Storage isn't cheap, but it is cheaper than the high capacity costs New Yorkers would face without an adequate replacement, and the cost comes down further if you factor in ancillary services and distribution savings the systems could provide. Fast deployment: The emergency Aliso Canyon procurements installed nearly 100 megawatts in about four months, running circles around the installation times for conventional gas or transmission infrastructure. Clean air: Storage facilities would provide capacity without any local air pollutants, succeeding where those old peaker plants fail. Zero-carbon: This one is tricky, because it's possible to charge batteries with coal or gas. Where new gas capacity will unavoidably emit carbon, though, storage has the potential to charge on clean renewable power. Renewables integration: Storage can reduce curtailment of wind and solar production, laying the groundwork for the higher penetrations required by state goals. Local resilience: After the wreckage of Superstorm Sandy, storage can be sited to provide local backup service to critical infrastructure, while serving peak load when there aren't any natural disasters. More efficient use of existing grid infrastructure: Storage can boost the productivity of underutilized generators and help mitigate congested transmission lines. Easy to site: With their small footprint and minimal local impacts, storage systems can slip into populated areas much more easily than a power plant. Siting lithium-ion within New York City has been a slow-going process, but outside of the city, this should be more achievable. The authors suggest setting a competitive procurement target of 450 megawatts for the New York metropolitan area by 2020. They also propose integrating storage into existing programs, like demand response and local government procurements. Statewide, New York could add a supplemental Clean Peak Standard, which calls for a certain amount of clean power delivered during peak hours. That would tweak the existing renewable portfolio standard to increase demand for dispatchable renewables, which almost exclusively requires storage assets to deliver. ...or just a lot of efficiency? The storage vision isn't the only option. Riverkeeper and the Natural Resources Defense Council, two environmental groups that led the charge to close Indian Point, released their own study in February. This report envisions replacing Indian Point with new renewable generation and a whole lot of assumed energy efficiency. 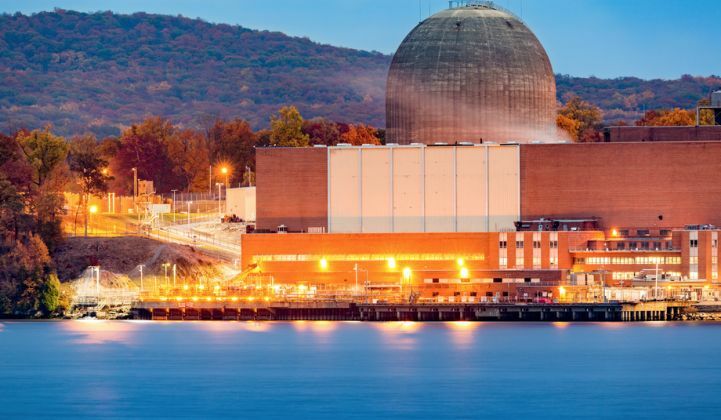 It models energy efficiency deployments -- assumed but not required by the state's clean energy standard -- that reach the equivalent of 91 percent of Indian Point electrical output by 2030. The nice thing about assuming large amounts of energy efficiency is that it reduces the predicted need for new capacity additions. Even then, in the cases where the nuclear plant retires and energy efficiency matches the hopes of the clean energy standard, the state would need nearly 4,000 megawatts of new gas capacity by 2030. That model, though, "builds to maintain resource adequacy, not to address local needs." Strategen's takes a hard look at the real-world needs of the New York City metropolitan area, uncovering local concerns such as the ozone non-attainment and its implications for existing peakers. Storage makes fleeting appearances in the Riverkeeper plan -- if you dig through the appendices you'll see some scenarios call for pretty substantial deployments, but not until 2028, seven years after Indian Point closes. Instead, that modeling puts stock in aggressive energy-efficiency programs, which the authors acknowledge aren't quite ready for primetime. "Critically, such a policy framework is not currently in place in New York for attaining the levels of energy efficiency contemplated in five of the six scenarios considered in this analysis," conclude the authors. "The levels of energy efficiency assumed in the CES order have no binding mechanisms" other than utility implementation plans that only require a fraction of the savings assumed by the CES order. New York has pioneered electricity grid reform that would achieve distributed resource and efficiency improvements through a competitive, market-based system, but evidently even that unfinished vision is not enough to achieve the highest efficiency improvements modeled in the study. "Relying on market-based initiatives and third-party developers to animate markets for energy efficiency, as has been the NY Commission’s stated preference, is unlikely to result in these high efficiency levels on its own," the Riverkeeper study notes. Grid-scale energy storage is still relatively new on the scene, and a 450-megawatt procurement would be ambitious by today's standards. Storage, though, has proven that it can follow through quickly when needed. That may count in its favor as New York figures out what comes after Indian Point.